OrgScheduler 1+1 does allow multiple users to update one calendar. Meaning the calendar belongs to everyone and everyone can read and write to it. OrgScheduler 1+1 gives you low cost network solution for sharing central planner simultaneously with everyone in your workgroup. You can even set network alarms to remind the whole office of an important event, like a meeting, in real-time, The program will show the complete list of active connections. ...... Access to the OrgScheduler is controlled by the user security profiles. This is why information is always safe with OrgScheduler, whether it is implemented on a local network or on the Internet. 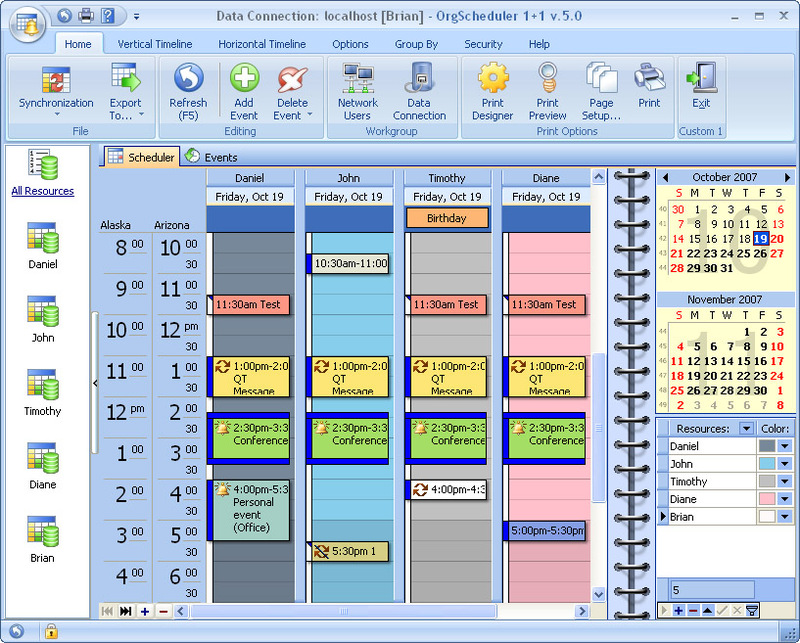 The OrgScheduler 1+1 is built upon the interface options introduced in Microsoft Outlook. OrgScheduler 1+1 includes importing from Outlook, exporting to Outlook, text, HTML, XML and Excel formats. OrgScheduler 1+1 features different time display options in the day view, 149 event coloring types to indicate an event's kind and importance, automatic hints that display an event's start and end time together with its caption, multiple look and feel styles, event recurrence control. Qweas is providing links to OrgScheduler 1+1 7.9 as a courtesy, and makes no representations regarding OrgScheduler 1+1 or any other applications or any information related thereto. Any questions, complaints or claims regarding this application OrgScheduler 1+1 7.9 must be directed to the appropriate software vendor. You may click the publisher link of OrgScheduler 1+1 on the top of this page to get more details about the vendor.